Elizabeth plays a varied repertoire - on pedal harp, celtic harp or electro-harp. The choice of harp may depend on your venue, your choice of music, or just which sound or look you happen to prefer. 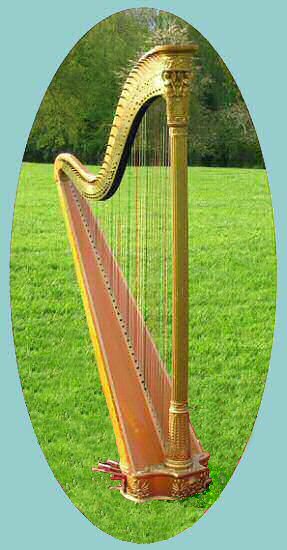 The harp is one of the most ancient of all instruments, and of all instruments, one which reaches most people. Sound affects our emotions, and creates atmosphere, more than does vision, and for a special day, what better sound than that of the harp? 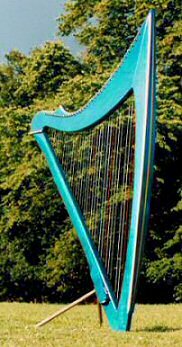 To the people we now call the celts, it was a magical instrument; when you hear a harp it's easy to see why. 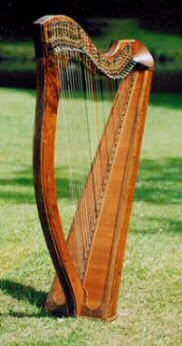 Small harp, made in Scotland: this is a traditional style celtic harp, in beautiful walnut wood. Its size makes it ideal for intimate settings, and also makes it the most portable of these harps, enabling to reach places where the pedal harp cannot. This also makes it more practical for occasions where the harp needs moving around during the event. Pedal harp by Erard: built in 1833, and first owned by The Lord Reay. Harps of this period are considered by many to have much more delicacy of appearance and clarity of tone than their heavier modern orchestral counterparts. The pedals enable the playing of more classical & popular music, as well as celtic music. Electro harp from Brittany: this very modern harp, with its distinctive looks, has a floating sound, and uses a discreet PA system.